DIY Chicken Coop Guide This chicken coop is small enough to fit in most backyards. The coop has plenty of room for 3-4 chickens..
DIY Picnic Table Traditional picnic table. Easy-to build even if you're a beginner builder. This table is heavy duty and will last many years. DIY Pergola Guide See the complete plans to build this garden pergola. PDF download is also available for this project. 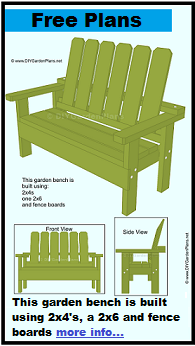 Adirondack ChairEasy-to build adirondack chair. A pair of these outdoor chairs can be built in just one weekend. DIY Gable Shed GuideSee the complete plans to build this 10x10 gable shed. PDF download available, as well as additional sizes. DIY Gambrel Shed GuideThis gambrel shed has a loft for extra storage space. Lots of sizes to choose from. DIY Saltbox Shed GuideThe saltbox shed has a unique and attractive roof design. Great for storage or in the garden.